It was the summer of 1991. Katarina Stojanović was 20 years old and was just finishing the first year of her bachelor studies in Ljubljana, Slovenia. She was taking driver’s lessons for a few weeks already and her 10‐year‐old brother couldn’t wait for his sister to finally get a license and take him to the seaside. Katarina was madly in love with her boyfriend and they just started planning a trip with their friends. It was going to be a wonderful summer. But then her country became independent and everything changed. In a few months Katarina lost her home, family and friends. And her identity. She was erased. What happened in Slovenia 20 years ago is still a painful evidence of how a young government violated human rights. 25 670 people in the new country shared Katarina’s destiny. They were unlawfully deprived of their legal status after Slovenia declared independence from the Socialist Federal Republic of Yugoslavia (SFRY). While Slovenian citizens became citizens of the new country automatically, those, who were citizens of the former SFRY or another Yugoslavian republic and had permanent addresses in Slovenia had to apply for it. There was around 130 000 people like that – mainly from Croatia, Bosnia, Serbia and also Slovenia. The majority got the citizenship, but almost 26 000 of them did not. They either failed to apply, or their application was refused or discarded. In some cases the procedure was even terminated. 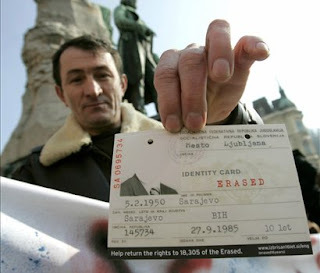 On February 26th 1992 those people lost their permanent residence status in Slovenia and by that all the economic and social rights tied to it. They lost their jobs, medical benefits, pensions. They did not exist “on paper” anymore. What happened that winter was “administrative ethnic cleansing”, it was “civil death”. Katarina’s parents were Serbs, so when the war started and the tensions between nationalities rose, they decided to go back to Serbia. Katarina, who was born in Slovenia, insisted she wanted to stay in the country she was brought up in and start a life there. Katarina had nowhere to go. All she had left was a little suitcase full of clothes and a note stand. After a few days of panic and thinking about what she should do, she decided to fight for her home. She first wanted to renew her identity card, but what followed then was beyond her understanding. The municipality official in Maribor simply took her identity card and cut it in half, saying “you are not from here, go back to Serbia!” As the lady threatened to call the police, Katarina, once again, ran away. For the next six years this was her life - running away from everything. She was secretly living in a basement of a student dorm. Every day she had to take a shower in another floor, so people would not notice she lives there. For a few years she almost did not have any warm food. To earn at least some money she was working illegally. She had false ID’s and false student cards; when she had to go to the doctor, she used another name. She travelled with a false passport, and when they did not let her cross the Slovenian border with Croatia once, she crossed it illegally. For years Katarina knew she was a criminal just by existing in Slovenia. Whenever she saw a policeman on the street, she turned around and went another way. A day did not go by without her looking over her shoulder. Everybody knew about the “murders on paper”, even Europe. But it did nothing to bring 25 671 people back to life. Slovenian Constitutional Court declared the act of erasing as illegal and unconstitutional and demanded from a country to provide redress for these violations. Twice. But Slovenia did not fully fulfill the demands; some of the people are still erased today. European Union had the chance to demand from the social state that was preparing to join the family of European Union states in 2004, to truly exercise the third article of its constitution and guarantee the protection of human rights and fundamental freedoms to all persons irrespective of their national origin. But it did not. Why was the European Union looking away then and why is it looking away now? From the day Slovenia applied for the membership in the EU in 1996 and until it actually joined 8 years later, the issue of the Erased has been debated upon largely in the national politics and media. This is why it is even more surprising that in years of negotiations the Erased were never properly addressed by the European institutions. Was it that the Union did not want to raise the question of neglecting human rights because its motive was to get Slovenia to join as soon as possible and without any major problems? Slovenia was always the most liberal of the republics in former Yugoslavia. After it established a stable democracy and moved easily to a market economy, it became clear to Brussels that this young country could quickly integrate into the European family. That would be Union’s first step towards the Balkan countries – then already it was clear that the EU’s goals for the future are to expand to the east. In the late 90’ the Commission no longer needed to be wooed. With Slovenia’s GDP higher than Greece’s and close to Portugal’s and the unemployment rate lower than in Germany or France, the Commission was hooked. The negotiation period went by smoothly, Slovenia requested and was granted a very limited number of transitional periods, which, according to the Commission, only proved how well prepared for implementing the acquis the country was. However, the Commission at that time already knew about the issue of the Erased. In a report about Slovenia in 1997, before the negotiations officially started, it first stated “no cases of inhuman and degrading treatment have been reported”. Then it mentioned the Erased, claiming there is “a group of around 5000 people who for various reasons have neither asked for Slovenian nationality nor claimed refugee status after the erasure”. The Commission proposed no remedy then, except of that about the government “taking the appropriate steps to resolve this problem”. However, no obligations for Slovenia because the Commission claimed it had “no jurisdiction” over the matter. No jurisdiction – no problem! The negotiations started a year later without even mentioning the human rights matters in Slovenia, not even in the chapter about home affairs. “The reason for that lies in the fact that the European Union was founded for economic reasons and economic reasons only, without any regard to the human rights,” says Neža Kogovšek Šalamon, a researcher at the Peace Institute in Ljubljana. Only later the Union developed other aspects of governing, among which there was the promotion of human rights, too. Another reason for the Erased not being mentioned in the negotiations talks is that the negotiations were not individual; there were six countries in the so‐called Luxembourg group that were aiming to join EU at the same time. Since all of them had quite similar predispositions, the negotiations were executed in a group. “It was negotiation for “a package of countries”, we could say. The same frameworks were prepared for all of the six countries, which is why Slovenia’s “personal” issues were not as precisely debated,” Boštjan Udovič, a professor of EU Enlargement at the Faculty of Social Sciences in Ljubljana is convinced. There is no doubt about the fact weather it was a political decision to include Slovenia in the Luxembourg “package”, according to Udovič. European enlargement is a matter of great political manipulations and not all countries in the accession process are treated the same. European Union had much greater demands from Croatia, for example. “After the incidents at the gay pride parade in Split last year, they sent a clear message to them how that cannot be a part of Europe,” says Udovič. It’s been 20 years from the erasure and some of the Erased, they estimate there is a few thousand of them today, still do not have their citizenship or residency. Slovenia has in the meantime enforced two laws and countless acts in order to solve the issue, which has been spiced up with a number of national disputes over it. That is also why most of the laws and acts are inadequate and require further thought and the adoption of additional measures. The first law (Act on Regularizing the Status of Citizens of Other State Successors of the Former SFRY in the Republic of Slovenia), which came in force after the Constitutional Court declared the erasure as illegal and unconstitutional in 1999, at least partially solved the issue. Some 12,000 people took advantage of the new law; 7,000 received citizenship, and 4,800 obtained permanent or temporary residency. Katarina Stojanović got her citizenship back in 1999 with the “naturalization law”. She was erased for 7 years. Today she is Katarina Keček, a married woman and a mother of two. And a successful journalist. She’s working at a private TV station in Ljubljana, preparing short documentaries about people’s lives and struggles they have to go through. For years she has been reporting about the Erased, telling sad stories of how they were left without their jobs, homes, insurance, loved ones, but kept quiet about her own. Only this year, 20 winters after the one that turned her life upside down, Katarina decided to reveal hers. The lives of the Erased have been out there for a long time already. They appealed to the European Court of Human Rights and to many other international bodies for human rights in the last twenty years. Some of them decided to step up and help, most of them did not. The European Union had the power to force the Slovenian government to stop ignoring the issue and to find a solution during the negotiation period for Slovenia’s accession to the EU. The effects of Commission’s opinion, which resulted in a naturalization law, proved that Slovenia cared about what Europe thought and it would easily enforce demands in-lined with the European aspect of human rights. Sadly, the Union was focusing too much on economic gain only. Finding a remedy for the Erased would also be an important precedent for other countries that have pursued policies of mass denationalization: Cambodia with ethnic Vietnamese, Myanmar with Rohingya Arakanese, Syria with Kurds, Ethiopia with persons with Eritrean affiliation, Bhutan with ethnic Nepalese, Vietnam with ethnic Chinese 'boat people' and France with ethnic Germans. But now it is too late. 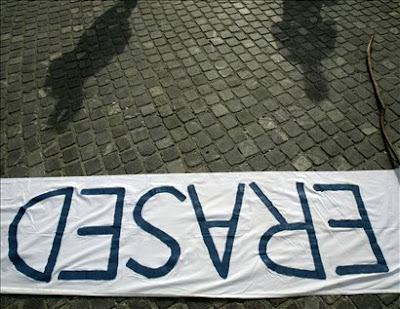 The Erased have become a Slovenian “internal issue”. It is also clear that the European Union is only a collection of national states that follow the logic of “mind your own business”. Which is why Slovenia and its politicians who would need a kick from the outside, cannot bring the Erased back to life for twenty years already.